I have been so impressed by every performance that has been part of the Dance Up Close/East Bay series at Shawl-Anderson Dance Center over the past ten months. Each engagement has been unique and different but the through vision is unmistakable - to support emerging choreographic voices, and bring new contemporary work to audiences in an intimate and personal setting. Mid to West Dance Collective is the latest chapter of this distinguished tome. Their new program, Part & Parcel, included works by three members of the collective: Mo Miner’s Specimen, Sarah JG Chenoweth’s Architecture Oriented Otherwise and Rebecca Chun’s You v the Powers that Be. Part & Parcel is a great compilation of contemporary dance – well constructed, diverse and thought-provoking material – and Mid to West Dance Collective is a gracious and talented group of choreographers that is definitely going places fast. A metal lab table with five small specimen jars was set downstage left, and as each dancer entered the space, that table was their destination. After everyone engaged in a few moments of investigating the vials, Chun climbed onto the structure. From her movements, it seemed that someone or a ‘group of someones’ was looking at her, examining her as the performers had just examined the jars. So began Miner’s Specimen – a piece about inquiry, observation and scrutiny. The lab table was then relocated to the back of the room and the cast of five began moving all over the space. Hand binoculars were fashioned around the eyes, suggesting the watching of others. But Specimen was a much more comprehensive approach to the concept of watching. How are one’s actions and movements informed by the presence of another’s gaze? How does intensity change? Demeanor? Attitude? And for those doing the watching, how are they altered and affected? Sometimes the dancers began imitating the movement phrases; sometimes they disengaged entirely; sometimes they intentionally tried to manipulate what was occurring in front of them, imposing their own will on others. As Specimen came to its conclusion, the vials reappeared, and the lights dimmed as each dancer sat holding one vial in their hand. They looked intently at the jarred material, as if it was the answer to a burning question. 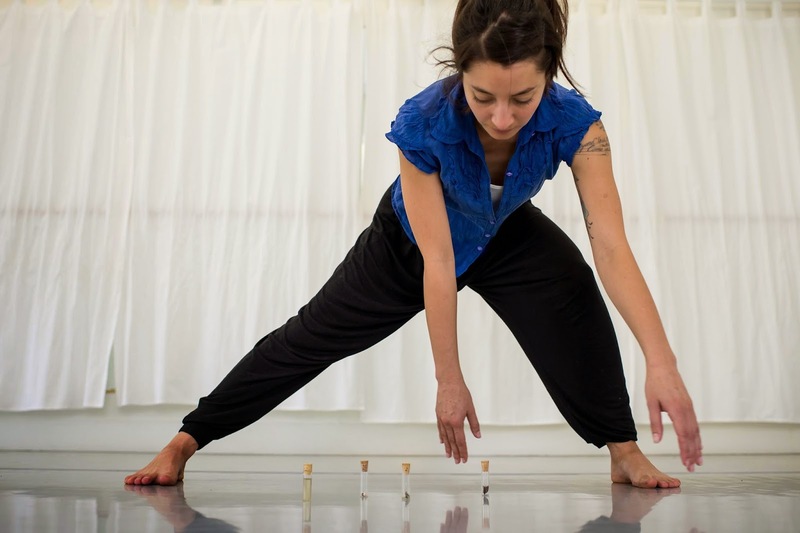 To begin Chenoweth’s Architecture Oriented Otherwise, dancers Kevin Lopez and Jordan Stout carried in planks of wood and four mismatched table legs. Immediately, they started organizing. Organizing is an important distinction here, because they weren’t necessarily building anything, at least not in the conventional sense. It was more placing, setting and rearranging, both in terms of these design elements and in Chenoweth’s choreography. Arms were lifted in the air and then dropped, legs folded into sit-up positions, wrists pivoted. Careful purpose and purposeful attention underscored everything; a constant cycle of ordering and re-ordering. But there was still a hearty dose of experimentation and some well-placed humor. Table legs doubled as ski poles; planks as dance partners. Appropriately, the planks and table legs were credited in the program as the ‘ensemble’ for Architecture Oriented Otherwise – the Judsonites would be proud. Dressed in black, a quartet of women took the stage in the final segment of Part & Parcel, Chun’s character-driven work, You v the Powers that Be. The four dancers began in unison, but Miner quickly separated herself from the other three, breaking out on her own. Together, the stoic trio continued accompanying the choreography with repeated singing and whispered phrases, ‘simmer down’ and ‘get in line’, respectively. The trio continued to confront Miner with a combination of pasted on smiles and intensely serious glares, trying to persuade and in some ways, bully her. After a set of solos, duets and trios, their attempts drew some success as Miner rejoined them, albeit with hesitancy and trepidation. In the last section of You v the Powers that Be, Miner intends to separate from the group again. They try and stop her, and pull her back as her annoyance and frustration grows. Until she is finally standing alone while the others dance on the perimeter. Had they given up? Had she won? Or had they moved onto someone else?